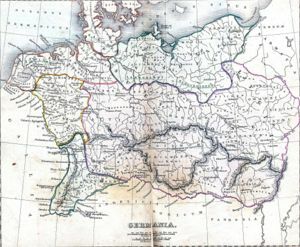 Depiction o Magna Germania in the early 2nt century. Germania (Greek: Γερμανία) wis the Greek an Roman term for the geographical regions inhabitit mainly bi fowks considered tae be Germani. It wis maist eften uised tae refer especially tae the east o the Rhine an north o the Danube. The auries wast o the Rhine wur mainly Celtic (specifically Gaulish) an haed acome pairt o the Roman Empire. ↑ Stümpel, Gustav (1932). Name und Nationalität der Germanen. Eine neue Untersuchung zu Poseidonios, Caesar und Tacitus (in German). Leipzig: Dieterich. p. 60. OCLC 10223081. ↑ Feist, Sigmund (1927). Germanen und Kelten in der antiken Überlieferung (in German). Baden-Baden. This page wis last eeditit on 18 Januar 2014, at 02:15.